With Avanti, you can have it all. From order entry through to invoicing, Avanti Slingshot enables you to work more efficiently, control your costs and move more jobs through the shop with ease. Create estimates that are both accurate and competitive. Never enter data more than once and reduce costly errors. Make client-requested changes and communicate them to the shop floor seamlessly. Stay in control of your inventory costs and know when to reorder. Your one-stop source of information on your jobs - past and present. Get all customer data seamlessly passed on to your shipping provider. Instantly understand your business through powerful reports. All customer information at everyone's fingertips including sales and service. Plan and manage this complex and creative process. 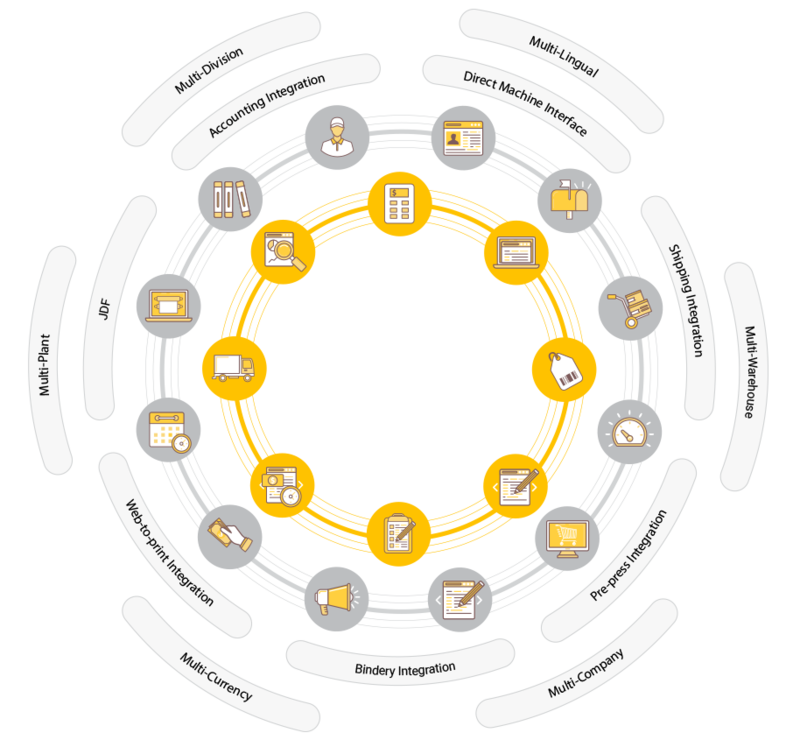 End-to-end management of fulfillment from estimate to delivery. See everything that is important to you at a glance, including real-time notification functionality. Create new customer purchasing opportunities through enhanced purchasing options. Break down the cost of a job down to every last detail. Create custom alerts so you can easily track what is going on in your business. Manage collections of all accounts receivables efficiently and effectively. Deliver on-time, every time even on the most complex jobs. Know your costs down to every last detail by tracking labor, materials and more on the go. Find documents quickly and easily using our "library" of documents. Easily manage "over-the-counter" transactions with flexibility. Avanti Slingshot was designed by printing professionals for printing professionals. 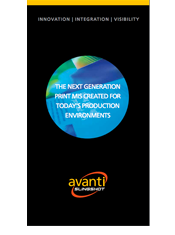 Avanti has been enhancing workflows for marketing services providers, commercial printers, large or grand format shops, print and mail providers, and in-plants for decades. 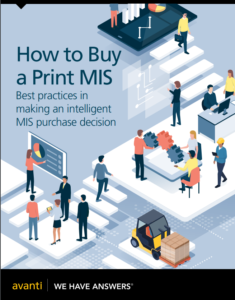 All aspects of estimating, production planning, warehousing, shipping and billing are incorporated into one easy-to-use Print MIS platform. Avanti Slingshot integrates industry best-practices to make your operation effective and efficient. Avanti Slingshot is the result of more than 5 years of research and development; this award-winning platform leverages advice from industry thought-leaders, customers of all sizes, and a rich 30+ year history in this specialized market area. Get the information you want, when you want it, and where you want it easily, with Avanti Slingshot. Easy-to-use Avanti Slingshot offers built-in intelligence, presenting real-time information when and where it’s needed. It can be accessed anywhere, at anytime, from any internet-enabled device, giving you the flexibility to get the answers you need, even when you’re “on the go”. 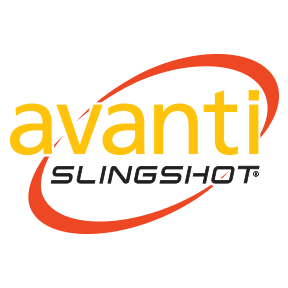 Avanti Slingshot can also be hosted on-premise. Connect islands of automation and eliminate breakpoints in your workflow. Avanti Slingshot’s Application Programming Interface (API) leverages industry-standard protocols like JDF and XML to enable communication with key applications, such as web-to-print, pre-press, post-press and production equipment. By communicating with third-party systems and equipment throughout the shop, Avanti Slingshot eliminates costly, time-consuming manual steps. 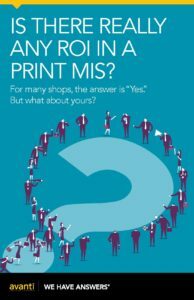 With Avanti, you will never have to buy another Print MIS. The platform is scalable and supports companies of all sizes, including multi-company, multi-division, multi-plant and franchise operations. For global clients, it provides localization, with region-specific settings such as date, language, currency, address and phone number. 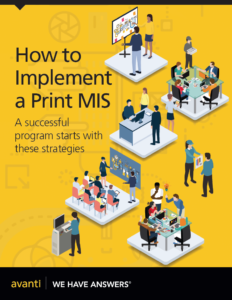 Is there any ROI in a Print MIS?